I am a big fan of Stuart Firestein's previous book Ignorance. It does a superb job of demolishing the traditional picture (as seen from outside) of scientific endeavour. As the author makes clear, facts may sometimes be interesting, but the driver behind real science is far more likely to be exploring our delicious areas of ignorance. This meant I had huge expectations for this follow-up title, and it's entirely possible that this anticipation resulted in an unnecessary feeling of being let down. But in all honesty I think it was also due to the writing. What Firestein sets out to do is to build up failure as the second parallel pillar to ignorance as a driver of science. Now, there's lots of good stuff in here about the importance of failure to science, and how too much of it is overlooked as it is very valuable, and how Popper was right but also wrong and so on and so forth, but it all seems flung together with little idea of structure and comes across as a failure (see what I did) if you consider the prime role of a book is to communicate effectively. 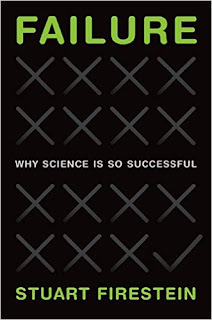 As one example of many, we hear about the importance of failure in the scientific method, but that there isn't really a scientific method, what scientists do is just pootle about, except they don't really, and though they clearly gain from failure they can't be said to learn from failure because that's too like what those horrid business people say. It's all far too woffly and unstructured. That might be intentional, as a metaphor for the nature of science, but if it is, it really gets in the way of providing an effective book. There is also a surreal moment (on page 170 in case you want to dip into a copy and enjoy it), when Firestein lumps genetically modified crops and nuclear energy in with astrology and alternative medicines as 'completely non-scientific practices.' I read this three times and still can't make sense of it. So there is some really interesting material here, and it is probably a must-have for Firestein fans like me, but it is hard work to extract those gems.